Horacio Carbonari has been sent out on loan to first division Coventry City. The loan is for the rest of the season. Carbonari will team up with ex Rams boss Jim Smith, the man that brought Carbonari to English soccer. The loan is expected to be made permanent in the summer, subject to Carbonari impressing at Highfield Road. 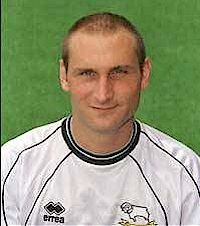 The central defender joined the Rams in June 1998 for a then record fee of £2.7million. His reputation as a powerful free-kick taker never really materialised at Pride Park and the “BAZOOKA” nickname was never in evidence from many deadball kicks that he had. Carbonari has not featured in any of manager John Gregory's team selections since the ex Villa boss's arrival and doesn't look to have impress the new gaffer at Pride Park. Horacio's debut should be at Highfield Road this coming Sunday. A match that is being televised, as Coventry take on Midlands rivals Birmingham City.